You wouldn't like Coburn. People don't, as a rule; he's not a nice man. And that's okay, because he doesn't like people much either. People are food. You see, Coburn's a vampire, and has been for close on a century. Five years ago, Coburn went to sleep - wasn't exactly planned - and he's just woken up to find most everybody in the world dead. And not cool, interesting dead like him; oh, no. Coburn looks basically human, and these guys... really don't. He likes blood, and they like flesh. He's smart; them, not so much. But they outnumber him by about a million to one, and their clotted blood cannot sustain him. Now he's starving, and on the run, and more pissed-off than a beestung rattlesnake. The vampire has to find blood, soon, and - like it or not - he's gonna have to keep an eye on the frail flesh-bags he finds it in. Time for the wolf to turn shepherd. No, Coburn doesn't like people. But he's gonna have to learn to. 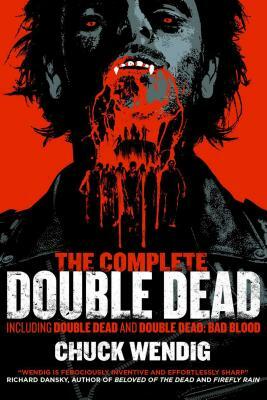 The Complete Double Dead collects Chuck Wendig's first novel and the follow-up novella, Bad Blood. Follow Coburn as he runs a gauntlet of supermarket cannibals, juggalos, super-zombies, and a ketamine-trip cult of zombie-worshipping New Age weirdos. It's a road that'll take him right back to himself, and onto the trail of his own vampiric sire. And on the way, he'll become something entirely new. Chuck Wendig is a novelist, screenwriter and game designer. He's the author of many novels, including but not limited to: Blackbirds, Atlanta Burns, Zer0es, and the YA Heartland series. He is the author of the upcoming Star Wars: Aftermath, and is co-writer of the the Emmy-nominated digital narrative Collapsus. He was a finalist for the John W. Campbell award for Best New Writer. He currently lives in the forests of Pennsyltucky with wife, son, and red dog. You can find him at terribleminds.com or on Twitter: @ChuckWendig.